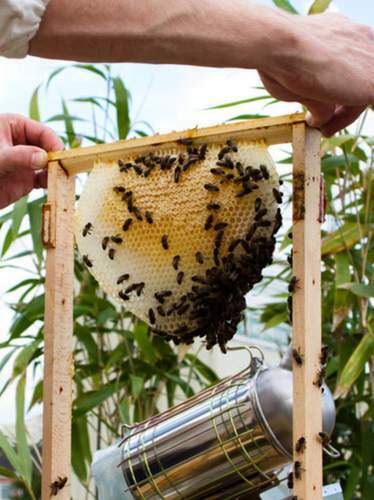 Want to take a trip to eco-friendly Amsterdam? Obviously, biological, organic and even raw food is all the rage in hip tourist destinations like London, Berlin, Paris and Amsterdam. And with its long term bike culture, Amsterdam has been naturally environmentally friendly since the existence of cars. Throughout the last hipster decade, it’s hard to find a lunch room, coffee parlor or restaurant that doesn’t have their menu filled with locally produced veggies or animal friendly steaks (if there is such a thing). So in this list I will suggest a hotel, a bar, markets and eco friendly transport, to rest no only your body and mind, but also your conscious during your stay in Amsterdam. They call themselves an eco design hotel and that, as with all eco stuff might sound like they are a bunch of stuck up smug bearded hotel people, the Conscious Hotel is not only the most eco friendly hotel in Amsterdam, it does so without the common smugness that comes with eco-friendly Amsterdam. Obviously the breakfast is organic and fair trade, the furniture is made of natural, recycled material and there are water saving waterheads (did you now people take showers twice as long as at home?) and led lighting. But they also thought of all the other environmentally friendly options. For instance the cabs they can ring for you are electric and their little souvenirs shop has great eco friendly gifts. But most important, they take their concept with a good sense of humor. As they say on their website: Eco-friendly but not Eco-fundamentalist. All throughout the hotel they have transformed the typical boring hotel signs into funny comments. Behind the concept of Conscious Hotels are 2 Dutch guys, consultants, who, as long time friends started to create their first hotel in 2009, when sustainability was still an interesting term. 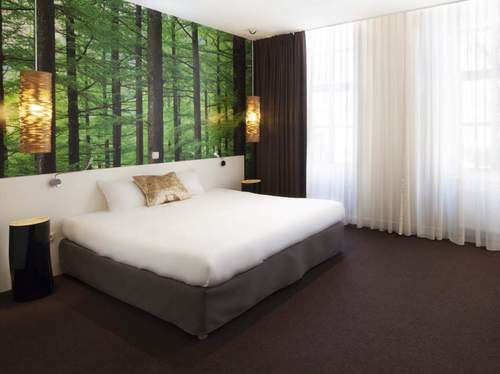 I guess their sober Dutch roots a background in business makes them aware eco friendly hotels in Amsterdam are not only a fashionable choice, but will have to grow bigger. They are building their 3rd eco friendly hotel in Amsterdam as we speak. De Ceuvel has all the ingredients to be the next big thing in the alternative, hip, self-sustainable Amsterdam scene. De Ceuvel opened a few year ago in Amsterdam North. The North is traditionally know as a working class area with lots of cheap social housing. Now, with innovators like NDSM and De Ceuvel leading the way, it’s on its way to be the next victim of gentrification. The website of De Ceuvel is bloated with hip phrases and fashionable fables like regenerative, sustainable, urban oasis with creative and social enterprises (of course all is in English). Basically it’s an old ship yard with severely polluted soil on a great location on the waterfront. Some local entrepreneurs with the urge to make the world a better place changed it into a ‘breeding space‘ by placing old house boats on the shore, connecting them with a boarded path. Specially planted plants are supposed to clean the soil. You can take a tour by one of the initiators to learn more. But most importantly eco-friendly De Ceuvel is a great location to hang out outdoors and sip a home made limonade or munch on an organic meal seated on a lot of recycled furniture or a old boat. De Ceuvel in Amsterdam North is a great hangout along the waterfront. Especially in summer there’s a lot of fun events organised here: live music and theatre, film screenings, swing parties (lindy-hop dancing! ), yoga (every Friday morning), a sauna festival and locally brewed beer festival. Check their agenda for these events. Open from 11.00 to 00.00 everyday, 2.00 on Friday and Saturday. Address: Korte Papaverweg 4, best reached by bike and ferry (from Buikslotermeerweb about 5 minutes by bike). Alternatively, you can take bus 34, 35 or 391 from Central Station (bus station is upstairs). Get out at Mosplein. Obviously, renting bike is a must if you have the guts to jump into the chaotic bike infrastructure of Amsterdam. Most hotels have their own bike rentals, or else there is one at pretty much every corner of the street. In summer, instead of going on one of the diesel engined canal cruise boats, you might enjoy the views from the Amsterdam canals on a pedal bike. For an hour the cost of an Amsterdam pedal boat is about 8 euros per person. Some canal bikes offer hoods in case it rains. Amsterdam Canal Company rents out canal bikes, great way to see the sights. 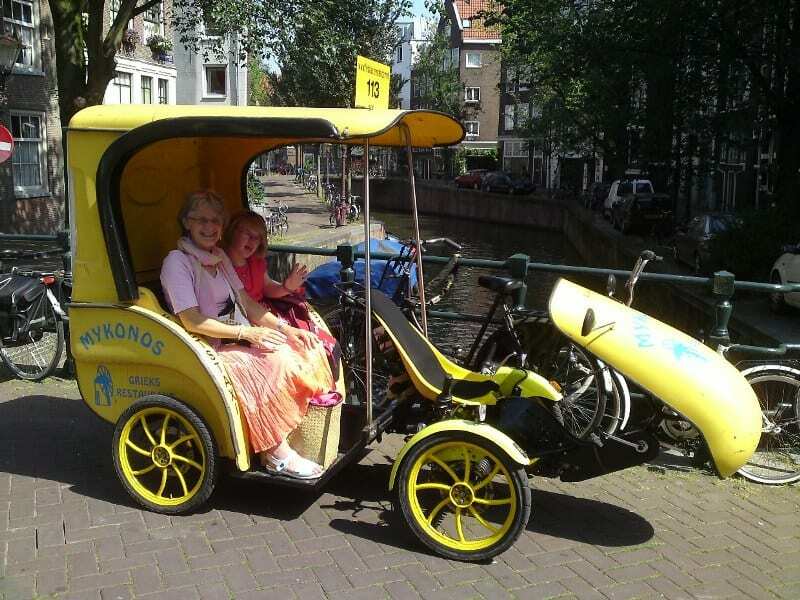 Or you can let yourself be biked around Amsterdam on bike taxi. There’s lots of modern rickshaws in centre of Amsterdam. Their drivers can take you on a nice tour to see the hightlights of amsterdam.But you can also use them as a normal taxi when you need to go clubbing in the night and need to get a taxi back. There’s been a lot of fuss about the uncontrolled rise in the amount of bike cabs (Amsterdam inhabitants are not so fun because these cabs because they take up a lot of space in Amsterdam’s narrow streets). A licence system is now in place with only bike with a black licence plate are official. You can hail a bike taxi on the street or call one. Prices are about 10 – 15 for a short ride in the center and 25 euros for 30 minutes. You call a bicycle taxi on 0031653481860. Alternatively, you can travel larger distances on a eco-friendly electric taxi. 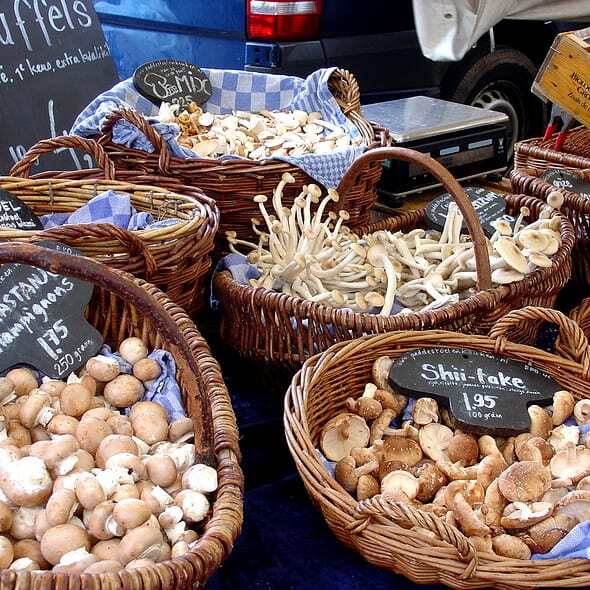 Mushrooms are speciality of the Amsterdam biological market Noordermarkt. 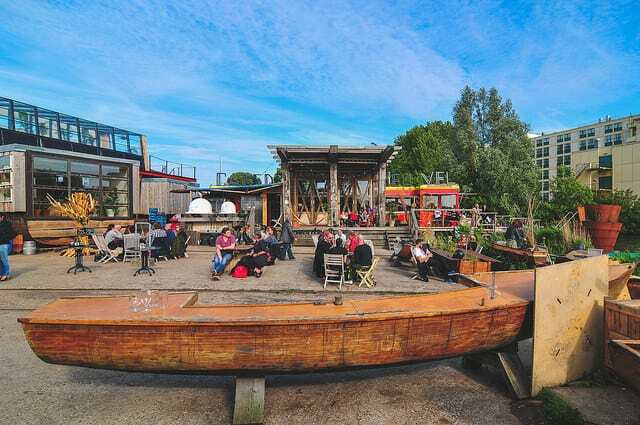 For a consciously pleasant stay in Amsterdam foodwise, a visit to one of Amsterdam’s rising amount of eco and bio markets might be a tasty and interesting thing to do in Amsterdam. The most well known and therefore busiest option is the eco-friendly Farmers Market on Noordermarkt on Saturday. The market takes place around the Noorderkerk in the Jordaan district so you can combine a visit to this great Amsterdam food market with walk around this historic neighbourhood with its small streets lined with fun cafes and boutiques. Nieuwmarkt, centre of the city, combine with a vist to the Red Light District and Amsterdam Chinatown. Zuidermarkt (Jacob Obrechtstraat), just East of Vondelpark. Buikslotermeerplein (from 1200 to 17.00). This is Amsterdam North, take the free ferry and go to above mentioned De Ceuvel afterwards. Haarlemmerplein (end of Haarlemmerstraat, combine with a walk around the beautiful Western Islands). Check the Amsterdam events calender for dates of the pop up market with lots of biological products Pure Markt and the eco-friendly Amsterdam NeighbourFood market and Sunday Market at Westergasfabriek.